It’s that time of the year when Hawkmoth caterpillars are on the move looking for somewhere to pupate in the soil. 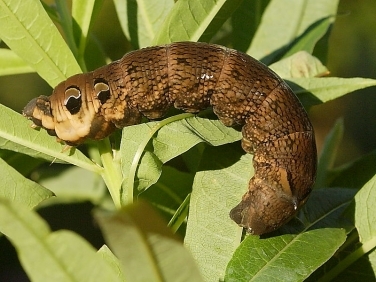 The caterpillars of Eyed Hawkmoth, Poplar Hawk-moth, Lime Hawkmoth, Privet Hawkmoth and Elephant Hawk-moth have all been see in the last week in various habitats around south west Cornwall. According to the identification enquiries received the most commonly sighted Hawkmoth caterpillar nationally is the Elephant Hawk-moth caterpillar – so often described as a large caterpillar with big eyes! More information on each species and many other Hawkmoths can be seen on the links provided. One of the reasons the Elephant Hawkmoth is so frequently seen is because it’s often found in gardens feeding on fuchsias. In the wild the caterpillars are frequently found on Rosebay willowherb. The one shown right was seen sunning itself and feeding on plantain on the grassy cliff tops of Predannack Head on the Lizard in Cornwall. The large ‘eye like’ markings behind its head are not eyes but act as a deterrent to predators.